The death toll from freak storms that hit India climbed above 140 on Friday as people told how they had no time to escape fierce winds which tore down homes, walls and trees. Many families in the worst hit states of Uttar Pradesh and Rajasthan spent the night fearing new chaos and the interior ministry warned of possible thunderstorms in the region on Friday. Victims told how 130 kilometre (80 mile) an hour winds carrying choking sand hit so quickly late Wednesday that they had no time to reach safety from falling walls. The dust storms claimed 121 lives in Uttar Pradesh, Rajasthan and nearby Uttarakhand and Punjab states, according to latest official tolls. Separately 21 people were killed by lightning in two southern states. Authorities in Uttar Pradesh, where 76 died, and Rajasthan, where the storms claimed 39 lives, battled to restore power, clear roads and help people who lost houses. Uttar Pradesh chief minister Yogi Adityanath cut short an election campaigning trip in Karnataka state to return to visit storm-hit areas where residents remain fearful. "We couldn't sleep and were worried if the storm hits again. We took precautions and secured everything but nothing can stand up to nature's fury," 40-year-old Agra resident Munna Lal Jha told AFP. 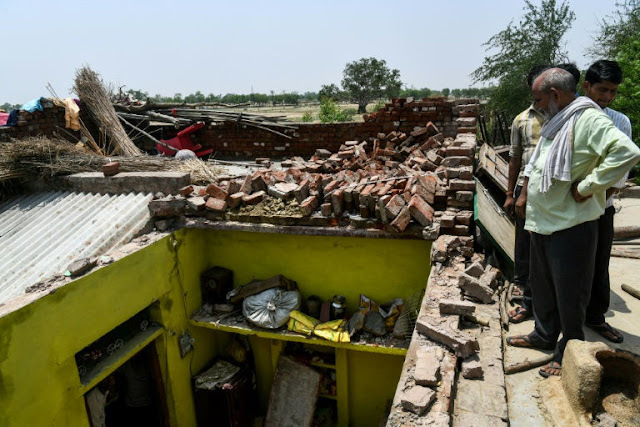 Agra district was one of the worst hit areas with at least 43 people killed, according to the state disaster management authority. Twenty-four of them were killed in the small town of Kheragarh, near Agra. Many people in the region live in mud-wall homes that would have barely resisted the ferocious winds. Four children from the same family were killed when a wall collapsed on them in Kheragarh. Damaged houses lined the town's dusty roads. Heaps of stones and bricks lay where dozens of homes were destroyed by the gale-force winds. Villagers salvaged belongings from under the debris or fixed broken windows and doors blown away in the storm. Some were only left to mourn. Ram Bhorosi told AFP how his son and a nephew died when their house caved in as they welcomed people who had attended his daughter's wedding. "We had guests at home and my son went inside the room to get a bed when the storm struck," he said. "A big stone crushed his head after the roof collapsed. His cousin was also caught under the crumbling roof. Half a dozen men helped us to clear the rubble to take out bodies. They didn't get time to raise the alarm, it was so sudden." In nearby Burera village, Anil Kumar told of his narrow escape when their house fell. "We were sitting outside when the winds suddenly started raging. Four of us were crushed under the debris after the wall fell. My grandfather died but the others survived with injuries." At Bharatpur in Rajasthan, another of the worst-hit towns, a college gate pillar toppled killing three young men, all 18, who had just been accepted as police constables or soldiers, media reported. The winds in Rajasthan raged at more than 100 kph, destroying houses and uprooting trees. Nearly 13,000 electricity pylons were damaged, snapping power supply to scores of localities and stranding many electric-run trains. The India Meteorological Department has warned there are likely to be more storms over a wider area until Tuesday. Storms and lightning strikes kill many people every year in India but this was one of the most severe series of storms in recent decades. The head of the Telangana state disaster management department, R V Chandravadan, said volatile weather would also continue in the southern region. Seven people were killed Thursday in lightning strikes and strong winds. "We have similar weather warnings for next two days," Chandravadan told AFP. Another 14 people were killed in Andhra Pradesh, which was hit by more than 41,000 lightning strikes late Tuesday. 1 Response to "India storm toll of death and devastation rises"
Well..I think they need to have a new home.